Let’s be honest, we’re all demanding customers with high expectations. We live in the era of touchpoint proliferation, where we expect services to be available whenever and wherever we want them. But at the same time, we expect it to work seamlessly, like magic. This is extremely difficult for an organization to deliver, because it’s so difficult to untangle the operational capabilities to meet the varying needs and pathways of the customer over time. To solve for the complexity, there’s a need for a flexible design tool to help visualize all that the customer experiences on their end and all the operations and collaboration on the business side that support that experience. A service blueprint is an operational tool that visualizes the components of a service experience in enough detail to analyze, implement, and maintain it. Blueprinting creates a collaborative canvas to plot out the orchestration of people, touchpoints, processes, and technology–both frontstage (what customers see) and backstage (what’s happening behind the scenes). They can be used to grasp the existing state of a service experience, or help define and implement new or improved services. Having a structured method to think through the operational and implementation needs of the experiences we design shrinks the innovation gap and propels more designs out of the studio and into full-scale service experiences. 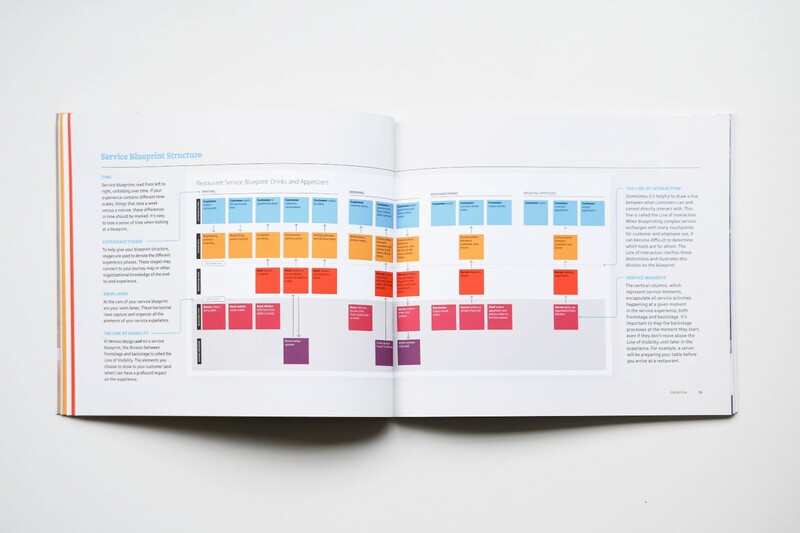 We’ve spent years working with the power of blueprinting methodology, constantly making refinements to our approach and the craft that surrounds it; and now, we want to share our learnings with the broader service design community. By sharing our tools, we can collectively advance the service design practice and its methods. We are thrilled to announce the release of our Guide to Service Blueprinting. The digital edition of the guide is free to download. Download our Guide to Service Blueprinting here. This guide is packed with tips and the actionable information you’ll need to start using blueprinting on your next project. While keeping in mind that this method continues to develop and evolve as more and more designers use it, we don’t consider this to be the definitive word on service blueprinting. Rather, it will provide a strong foundation and the building blocks for you to explore and evolve this methodology. We would love to hear what you discover as you use this tool and how you’re adapting the blueprint to new applications and contexts. Join the conversation around blueprinting on our Medium page or tweet @adaptivepath to share how you are putting service blueprints to use. Now get out there and blueprint some experiences!